Unclogging your toilet could cause you trouble if you don’t know what you’re doing. Unclogging a toilet is something that at least one person in the house should know how to do it, and if you are living in your own and you don’t even know how to do this then you are going to be in trouble at some point when you need to put in practice this simple thing. There are many ways to do the unclog a toilet, the way you do it depends on the tools you have available for the job in your house. The basic thing you need to unclog a toilet is a plunger, there are different type of plungers you can use to unclog your toilet but there are some plungers made of rubber that are specifically made for this kind of job, these plunger fit perfectly into the hole of the toilet making the unclogging an easy job. Most of the times you only need a plunger to unclog your toilet. What do you do if for example, you are doing a party in your house and your toilet is a mess, you don’t have a plunger and the stores near your house are closed? 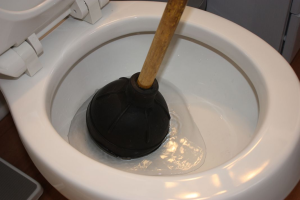 There are other kinda traditional ways to unclog your toilet if you don’t have a plunger available, I’m going to tell you now a not so known way to unclog your toilet without using a plunger and without calling anyone to help you, this may get you out of a problem. To unclog your toilet without a plunger you need two or three things to do it successfully and you can always find these things in your house, you are going to need a bottle of shampoo or liquid soap and hot water, these are the only things you need to unclog your toilet. Now, how do we use these things? Put the shampoo or the liquid soap into a bowl or something, fill the bowl with the shampoo with water and then throw it to the toilet; the success of this method depends on what is the problem that is causing the clogging in your toilet. The liquid soap or the shampoo is going to help the water to flow easily, and the hot water is going to help to destroy the paper or the thing that is stuck in there, if it is something like hair then this is not going to work. If you can’t unclog your toilet using a plunger, or using the shampoo method then you should try the vacuum method. This is not something you can do with just a normal vacuum, it has to be a vacuum that can be used inside water. To be able to extract the thing inside your toilet, use something to close the toilet until there is a hole to enter only your vacuum, then start using the vacuum and you will be able to extract the object inside your toilet. Another method is using something large to get inside your toilet and push the object and unclog your toilet, a wire coat hanger is something really useful for this kind of things. Just bend the wire coat hanger and use it in this method. There are more ways to unclog your toilet but these are some of the methods you could use.